If you were born with a red birthmark known as a port wine stain, we understand what you’ve gone through your whole life. These can be really tough birthmarks to live with, because they’re often very visible to others and poorly understood! Celibre Medical has treated many patients with red birthmarks and we are always moved by the stories our patients tell us. From having to explain what it is to everyone you meet, to the long stares, and the difficulties of covering it with makeup, these are just a few of the many trials that you’ve gone through if you were born with this type of red birthmark. But maybe you’re ready to get rid of it once and for all? Though you’ve dealt with the frustration of having it your whole life, you’re ready to feel comfortable in your own skin and ready to shift your focus off of your port wine stain and onto something else in your life. Celibre Medical can help you. 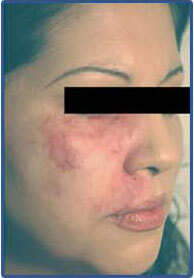 Our FDA-approved pulsed dye laser is extremely safe and effective at removing port wine stains. What is a Red Birthmark or Port Wine Stain? The medical term for them is naevus flammeus. They are present at birth and are caused by very dense and malformed blood vessels close to the skin’s surface. They only occur on one side of the body, and although they can appear anywhere on the skin, they usually affect the face and neck area. Three out of every 1,000 babies is born with a port wine stain. Just like the name implies, they look like a red or purple discoloration or “stain” on the skin. And they are usually flat and uniform in their color and appearance. They are caused by a random, genetic mutation that occurs during development in the womb, so they don’t tend to “run in families” and they are not caused by anything that your parents may have done or not done during pregnancy. How Do Lasers Work to Get Rid of Red Birthmarks? At Celibre, we use both Cynosure and Candela pulsed dye lasers. Because these lasers target the hemoglobin present in blood vessels, it is the perfect go-to for these red to purple colored birthmarks. Over the years, Celibre has treated thousands of patients with red birthmarks. They can be really difficult and tough to treat. We understand and prepare you for the long road ahead if you’re ready to have yours treated with laser. Because these birthmarks are so packed with blood vessels, they take a lot of treatments spread out over a long period of time. While it can be frustrating and difficult to wait for in our world of instant gratification, our patients tell us that the entire process is totally worth it. Removing your red birthmark with laser is life changing for anyone who decides to go through treatment. 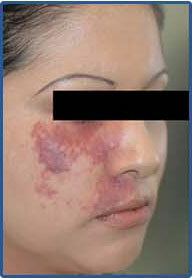 Give us the opportunity to discuss our laser treatment program for red birthmarks with you. If you’re ready, we are here to begin this journey with you. Call us to schedule your free consultation at either of our Los Angeles or Orange County offices. Don’t live with your unwanted red birthmark another day. Let Celibre Medical be your partner in taking this important step in changing your appearance and your life.